Taste Pinot Noir, walk pristine beaches or spectacular cliff tops, catch a wave, paddle a sea kayak, tackle the fairway at Cape Schanck, visit the thermal hotsprings or even sail Port Phillip Bay – and feel the difference…when you visit the Mornington Peninsula wine region. A combined travel tool, image gallery and source of regional information of a beautiful wine region specialising in Chardonnay, Pinot Noir and Pinot Gris only 1 hour from Melbourne, Australia. 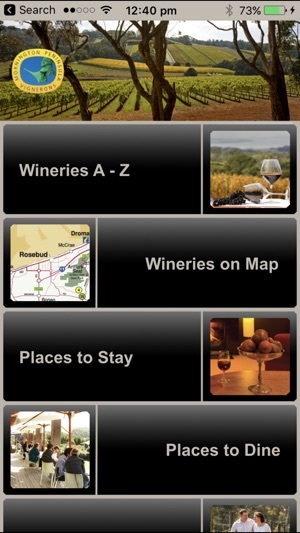 Includes a complete official list of wineries, places to stay, places to dine & places to visit with up to date phone and email contact details, and click through to all websites and details of regional wine events. Almost 60 cellar doors including opening days & hours, food offerings and interactive locations on the map providing routes and directions while you are visiting. Some call it Melbourne’s playground, others home, either way it is a special place that for almost fifty years has had a powerful attraction – especially to the region’s winemakers and vignerons who invite you to visit.